A stunning sitting room with high ceilings was created using a soft palette of greys, taupes, silver ,blues and gunmetal colours. The brief was to design an elegant sitting room to relax and entertain with family and friends. The ceiling was brought down by decorating in grey to the dado rail. Beautiful hand made curtains consisting of a linen and velvet stripe designed to frame the bay window. Furniture from the clients previous home which Mimos Interiors had designed were integrated with Art work ,coffee tables, console side table, lamps, mirrors and a bespoke rug by Sylka with a leather border, which grounds the space and adds a luxurious feel. 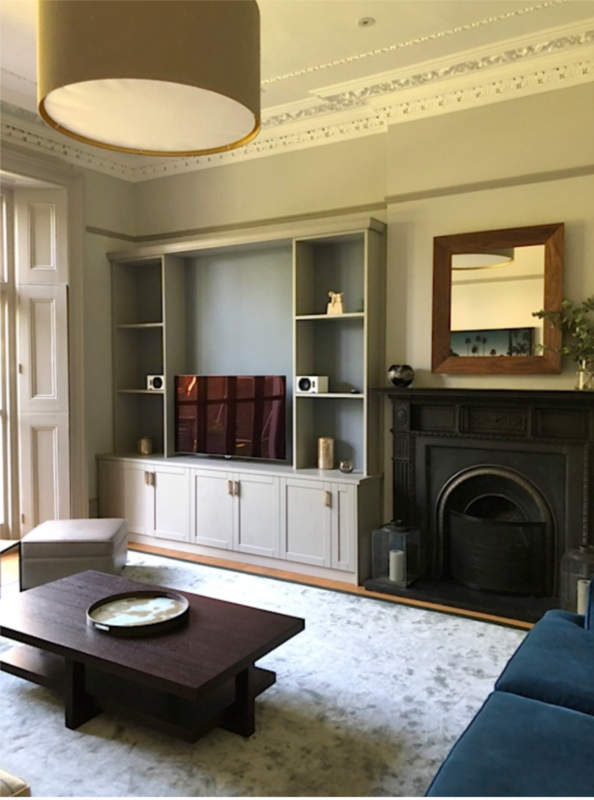 A bespoke media unit was designed to create an atmosphere in a large family sitting room but to also create storage and for display purposes,an LED light was introduced to back light the shelves and above the cornice. A textured plain wallpaper from Arte was used for the back of the unit to create softness and depth, and beautiful fossilised wooden handles adding a unique touch. A bespoke Walnut mirror was designed for above the fireplace bringing extra reflected light into the room. The classic Anniston chair by Maries Corner was introduced using a soft blue linen and a leather taupe footstool. A luxurious bespoke rug in pencil with a teal leather border was introduced to make the room cosier. 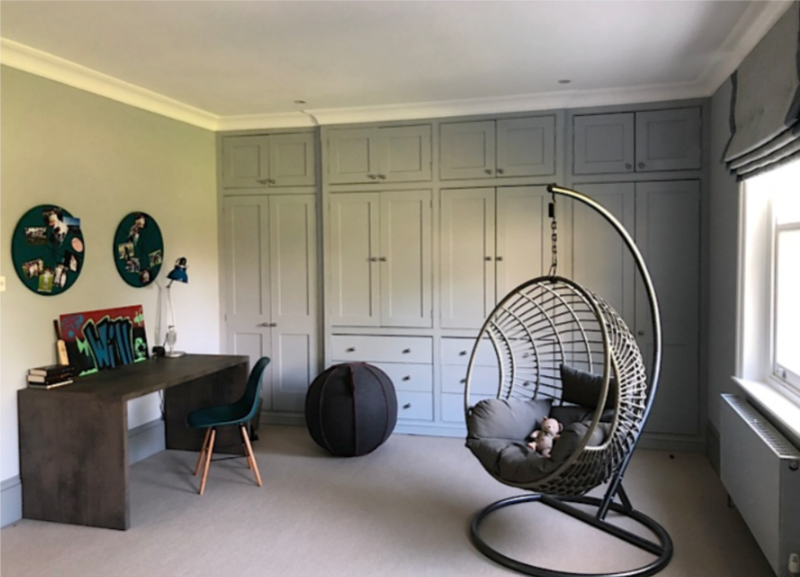 A fun swing chair with a felt ball was introduced into this teenagers room to hang out with his friends, with a custom made desk with textured concrete effect, both being versatile and practical. These were set on a back drop of soft blues and greys with his favourite football player in the limelight over the fireplace. The brief was to create a fun, elcectic space for the client and his young children. It was important for it to be stylishly quirky, with an understated elegance. 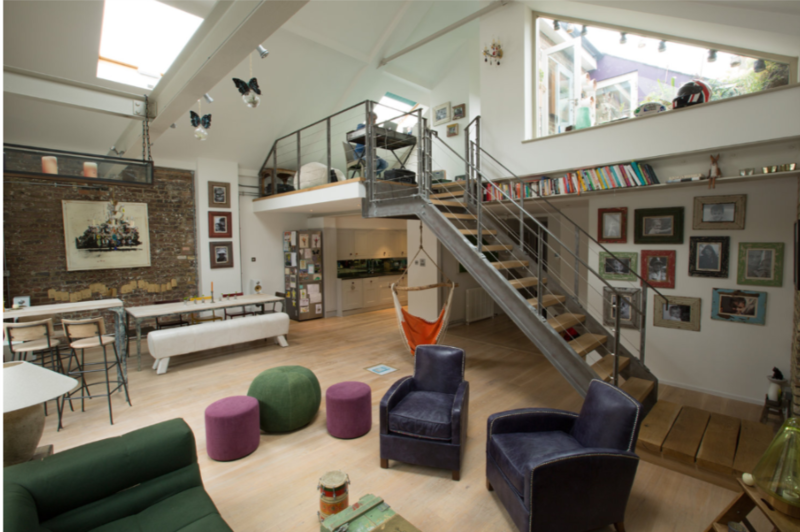 This was created by replacing a spiral staircase with a steel and oak staircase, introducing skylights and rooftop windows bringing the outside in. The kitchen was revamped with antique green mirror splash back and multi coloured handles, further strong colours were introduced using vintage chandeliers, furniture form B & B Italia, Ochre and Maries Corner, creating fun and stylish space for friends and family. the wardrobes and cupboard doors, with funky glass handles. A reclaimed Oak bed was designed, to set the tone of the room and to help with the low lying ceilings, couldn't resist adding the playful swing for the client who has never quite grown up !!!! and a contemporary chase made by Maries Corner , great for snuggling down with a great book. The En-suite bathroom was revamped using beautiful mother of pearl tiles for the splash back. 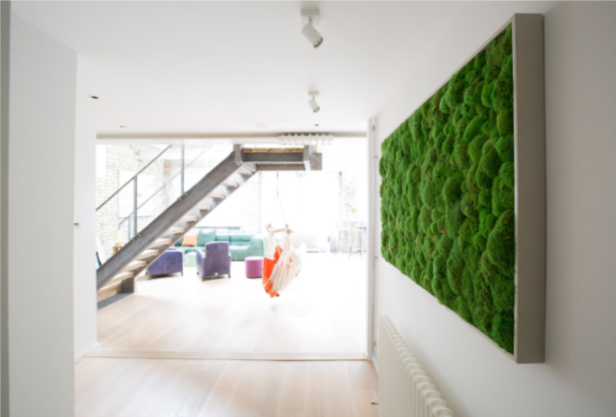 The Entrance Hall was given a blast lush green by installing a Real Moss picture. The brief was to create a informal yet elegant sitting room using the clients existing elegant sofa, rug and tapestry. Two tier bespoke lamp- shades were created, lined in gold to create a warm light to the room and to bring the ceiling down. Glass coffee tables and side tables were added for the room to remain uncluttered and elegant. 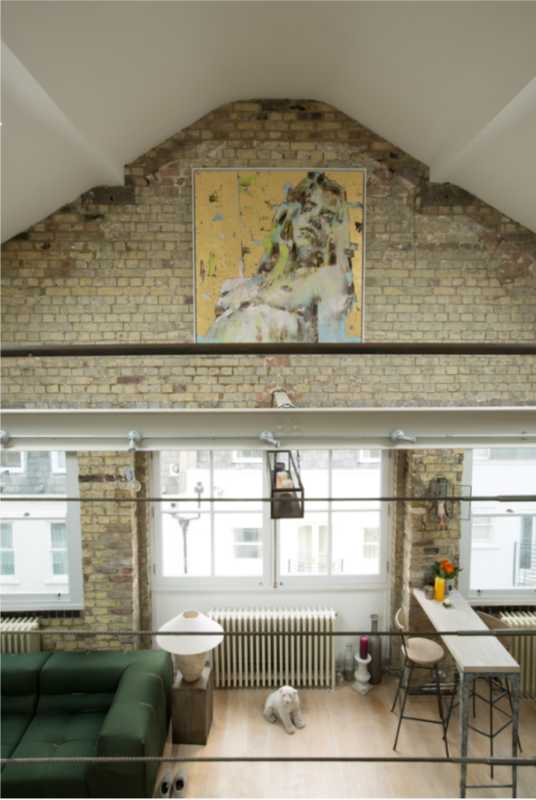 The brief was to create a classically contemporary home for the client to relax, entertain and work from with her teenage daughter, an oasis away from the hustle and bustle of London. The sitting room had very little natural light so it was vital to have a good lighting design, using dimmable downlights, and accent lighting using table and floor lamps. A window seat was created using a soft chenille fabric seat cushion and bolsters, and giving extra storage, Roman blinds were made to allow as much light in as possible. A Luxurious sectional sofa from Tamarisk with the softest pink velvet chair set the tone, with elegant floor and table lamps in polished chrome and silk lampshades, with a back drop of dimpled silk curtains with a triple pleat heading. 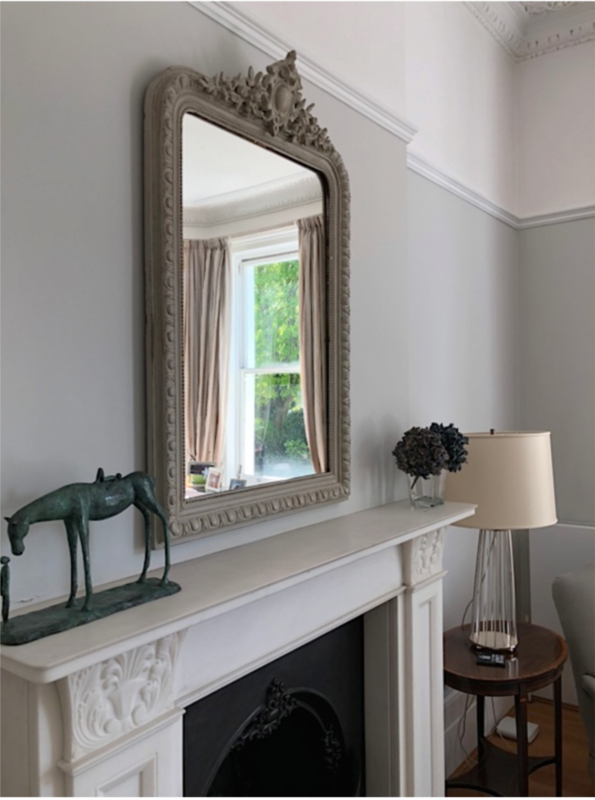 A console table cleverly conceals a radiator, with table lamps and purple lampshades adding accents of colour to the scheme, painting an existing mirror frame bringing further light into the room, set on a sumptuous velvet grey carpet. A peaceful space for the client and her daughter to work in,bespoke cupboards with fossil handles and open back lit shelves to create an ambiance and place for pictures, complimented by a seamless bespoke desk and cabinet, with a taupe wooden venetian blind to create light and privacy. 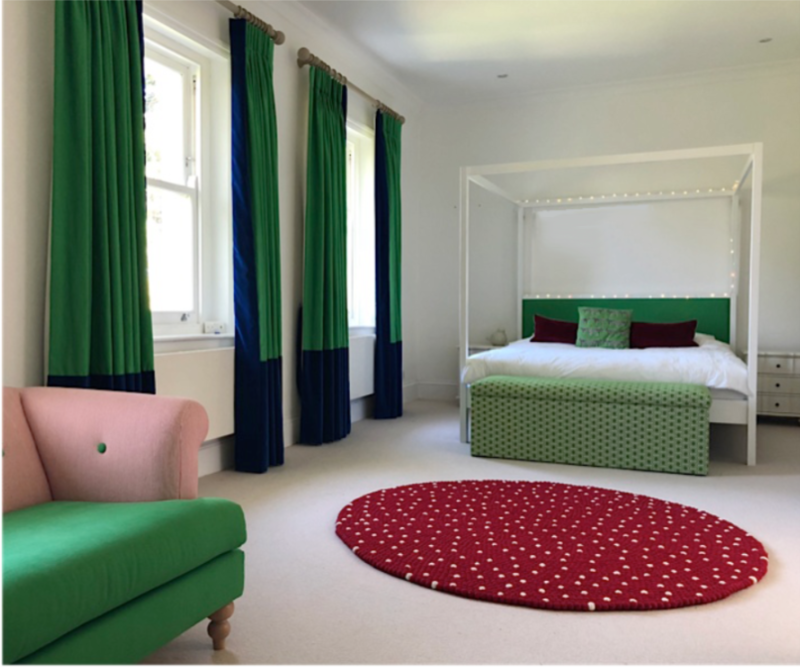 In order to make the guest bedroom as spacious as possible, Roman blinds were installed, with hanging bedside sparkling droplet lights from John Lewis, and a bespoke cylinder lampshade with diffuser to create a very soft and pretty light. The same lighting effect was created in the upper landing with wall lights and a suspended lampshade bringing the rooms together. The brief was to create a stylish living area for a young family of three children to be both practical and enable the family to entertain informally, in a light and airy space. 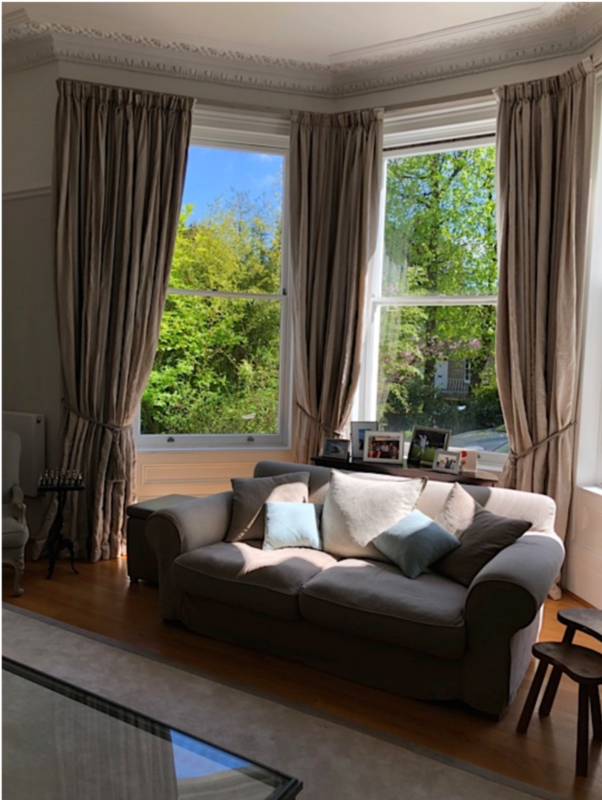 Linen sofas were chosen from Tamarisk with removable covers set with luxurious cushions from De La Cuona, with a simple white cotton/ linen mix Roman blind and pinch pleat curtains to allow as much light in as possible. Bespoke shaker style alcove cupboards were designed, and an iconic Barbara Barry table lamp selected to set the tone, and a vintage chandelier from Mimos Interiors placed over the dining table to create two zones in an open plan living /dining area. A small conservatory ware appeared separate form the living area by introducing a bespoke sisal rug and a fabulous Louis V armchair made in France, upholstered in a grey linen, complimented by a beautiful Porta Romana floor lamp, a bespoke ottoman was made for storage for toys and a seat. A polished chrome Georgian lantern, mirror and coatrack creates an elegant small hall, with contrasting paint colour below the dado rail to create interest in quite a bland space. A practical bench with storage was introduced for the children shoes, with the clients existing antique console table. A family sitting room was created using a palette of stone, camel , tan and oranges , with textures of leather, suede, and chenille fabric. Maries Corner classically contemporary armchairs worked well in the lovely period property, with the childrens Louis V chair hand painted in yellow polka dot fabric, and the sumptuous Mulberry leather beanbag with Milo the Kitten ! A minimalist teenage bedroom was created by designing bespoke desk, cupboards and wardrobes,, with a remote controlled LED strip light which changed colours. French Louis V armchairs mixing traditional design with contemporary using Designers Guild fabric. Small downstairs cloakroom making a statement using a wallpaper by Cole & Son, one of my favourites. Bespoke console table made to fit around an existing radiator, with large balloon able lamps and nickel lantern introduced to mae a narrow hallway have a welcoming effect to the home. The double reception room required to be luxurious as well as practical for a young family. 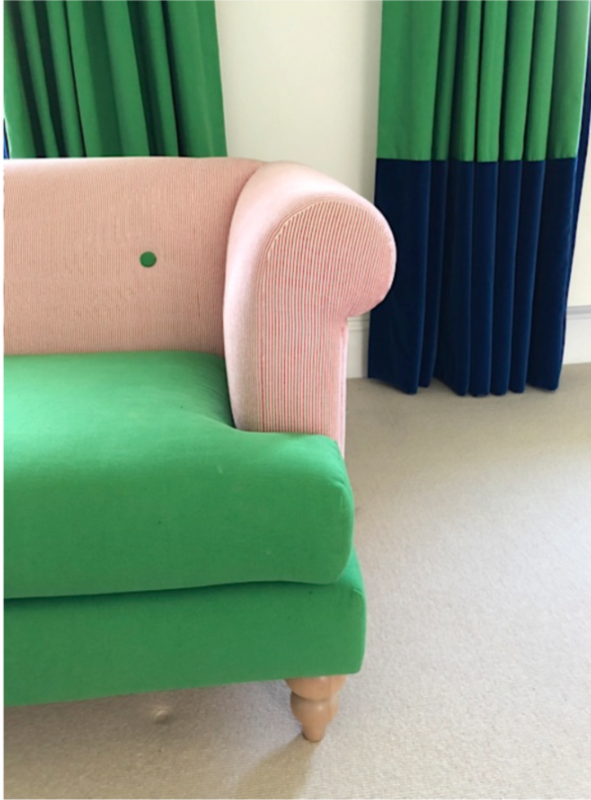 Sumptuous satin curtains, Maries Corner furniture in soft velvets and chenilles, combined with Porta Romana lights created a sense of glamour, with bespoke floor to ceiling push click cupboards in the back reception for storage for toys and a Maries Corner chaise to complete the scheme. The client wanted the Master bedroom to feel elegant and sophisticated, rich satin curtains were made with bespoke seamless fitted wardrobes and an Art Deco dressing table creates this ambiance, with bedside table lamps and bed throw in soft greys and purples in velvet and silk. A heavy sandstone fireplace dominated the room and was removed and replaced by a minimal gas fireplace, and a bespoke minimal hit cylinder lampshade installed with downlight positioned infant of the wardrobe creating a poole effect.